The Black Speedster is the same reel as our standard Speedster but finished in an anodized black color with orange accents. The orange accents are located on the drag knob and drag cassette to add a little extra flair. The Speedster is a super-high retrieve rate reel with a narrower spool, inboard mounted handle and an outer diameter significantly larger than our highest performing reels. 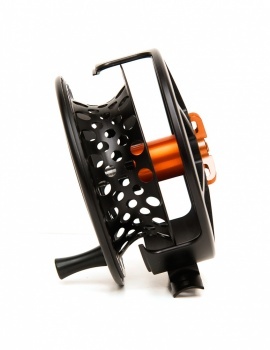 The narrow spool prevents line barreling, the added circumference and inboard handle improve retrieve rate. Mate these features with our time tested smooth as silk, maintenance free drag system, classic Waterworks-Lamson styling and attention to detail, and you have what the name implies: A Hot Rod of a reel.